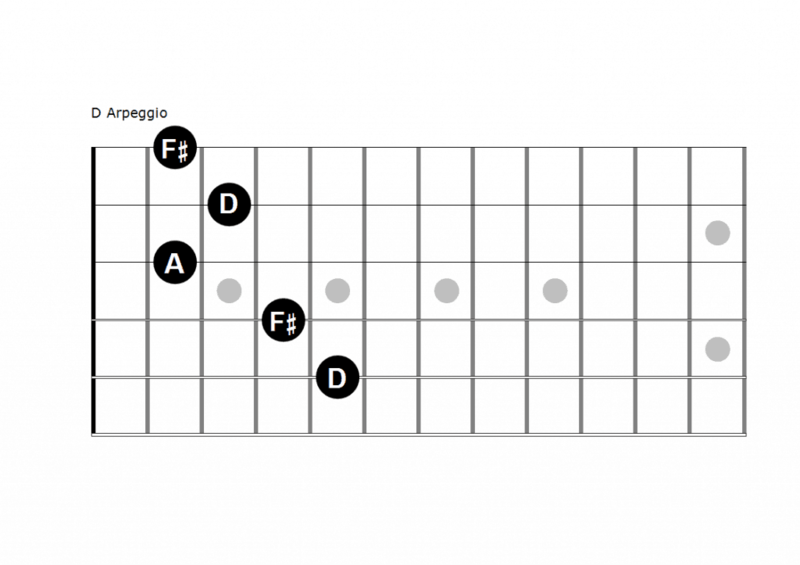 Guitar Arpeggios: How and When to Play Them | Zing! This article is by teacher and Gypsy Jazz virtuoso Yaakov Hoter of GypsyandJazz. Check out his site for lots more exercises and training. Guitar arpeggios can be great tools to improvise with, as they use the notes of the chords in the accompaniment to create well fitting melodies and interesting lead licks. There are vertical shaped arpeggios which are based on barre chord shapes, and horizontal shapes which work well to connect different shapes together. These work in the same way as scales, which have a variety of positions across the fretboard. Arpeggios are simply broken chords, which is why they are so reliable when playing with chordal accompaniment. Wrong notes are impossible with this method, so it’s a great way to build your confidence as a lead player. 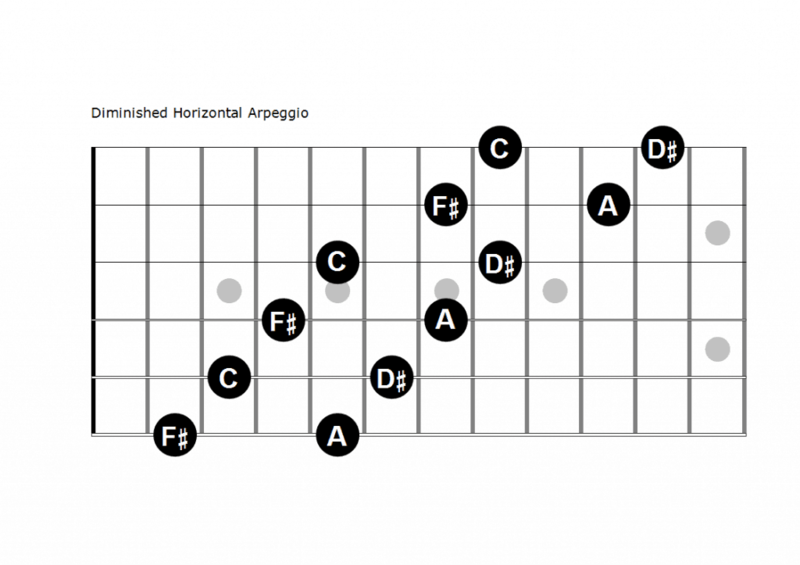 Today, we are going to learn the system of arpeggios over our entire guitar fingerboard. We will learn five basic arpeggio positions, then see how we can implement them and create great improvisations over a minor blues by Django Reinhardt called Swing 48. In Gypsy jazz, we use the minor 6th instead of the minor chord, so it’s four bars of Gm6, two bars of Cm6, two bars of Gm6, one bar of Eb7, one bar of D7 and two bars of Gm. You also have the option of a turnover of Eb7/D7 in the last bar. If we have G minor or G minor 6th in our accompaniment, a G minor arpeggio will accompany it perfectly as it plays the notes of the chord one by one. In order to improvise effectively and confidently using arpeggios, we need to know the shapes so well that we can create melodies moving from one arpeggio to another. 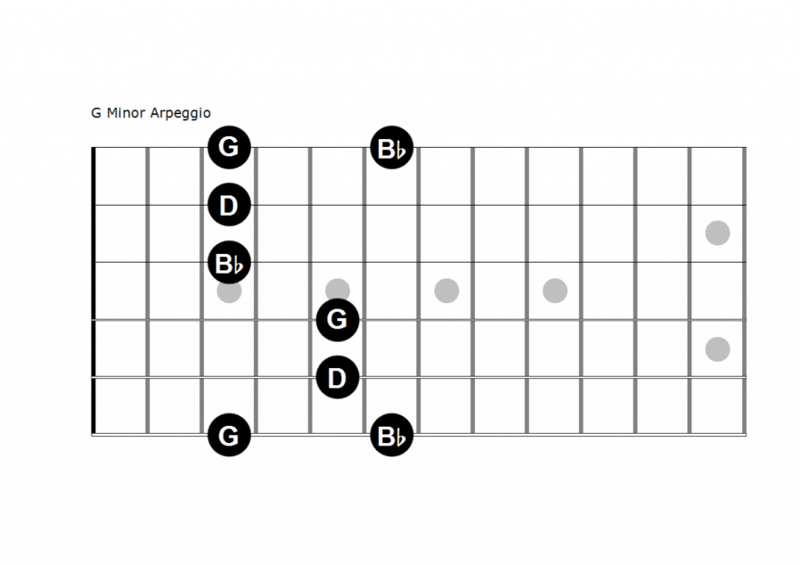 To gain this skill, we get to know the arpeggios all over the fingerboard. Technically, you have twelve positions for each chord (one for each fret). But that can lead to some weird fingerings. It makes more sense to use five positions all over the fingerboard, plus horizontal positions that cross the entire fingerboard. The more shapes you know, the more options you will have in your improvisations. First, we are going to learn the vertical positions, which are easy as they’re based on chord shapes you already know. The only difference is that they add the third level of the scale on the same string as the tonic when necessary. As with all technical exercises, when you’re learning new shapes, play them slowly, and then increase the tempo. You can play arpeggios as continuous repeating exercises to improve your technique. Once you have memorized the above guitar arpeggios in a few positions, you can use them to create melodies. First, play each arpeggio whenever the corresponding chord is played in the accompaniment, as an exercise to get used to them. When you get used to playing the arpeggios up and down and moving from one to another, it’s time to create your own melodies using the notes. Instead of just playing the arpeggio, play some notes around it, maybe using a half-tone approach or a trill. 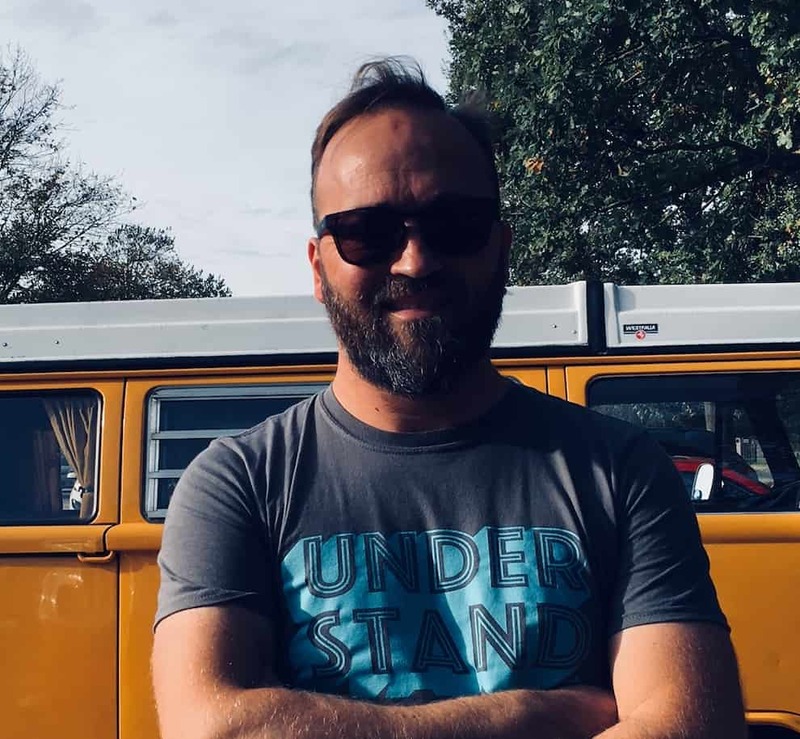 One I use all the time is: a down-stroke on the note that I want to play, upstroke on the note one tone above that, pull-off, down stroke half a tone below and up stroke again on the target note. Play inside the arpeggio in a consistent rhythm, and add that trill here and there. It gives you an interesting sentence. Use another melody from the song within your improvisation and it will enrich the arpeggio. If you play the Gm arpeggio and put in a phrase from the melody and then get to Cm, play with the rhythm and direction of the arpeggio and then put in another melody, you’ve created a nice improvisation. You can use trills, add bits of melody, repeat phrases within the arpeggios, and use any other improvisation tricks that you’re familiar with. 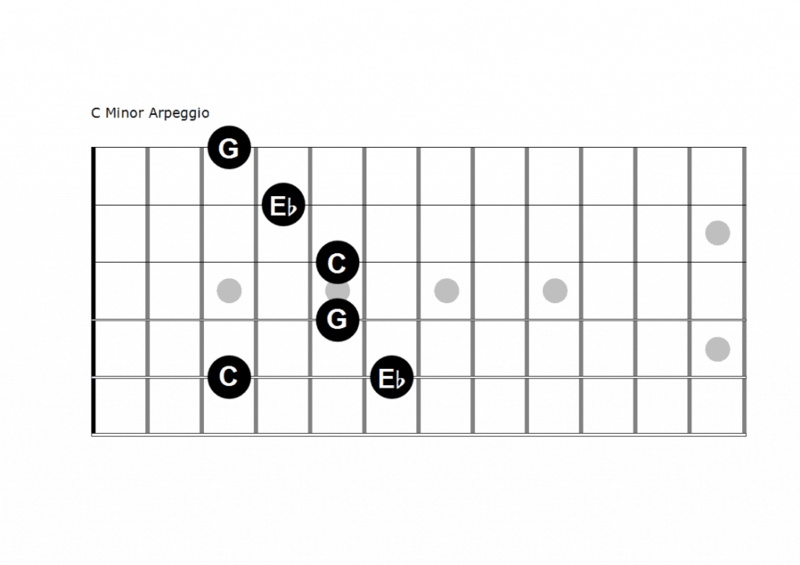 Play around with your arpeggios, ornamentation, timing and melodies. Now, let’s add horizontal arpeggios that move all over the fingerboard. They’ll help us move around from one area to another. The horizontal diminished arpeggio can be good fun, as if you play a diminished chord over the third degree of a dominant chord, you get a flat 9th sound. F# is the third degree of D7, so we can play a diminished chord from F# in bar 10 of our chord progression, giving a great 7, flat 9th sound. Tricks like these fit well with Gypsy jazz and jazz in general. The diminished arpeggio is also a great technique exercise. On a more general note, these horizontal positions are great tools to reach higher positions on the fretboard. So, if you played Gm in one position, you can use a horizontal arpeggio to find your way up to a Cm arpeggio in another position. A great trick when you’re improvising throughout a piece, is to start each chorus in a different register, so the solo expands into different areas with each chorus. 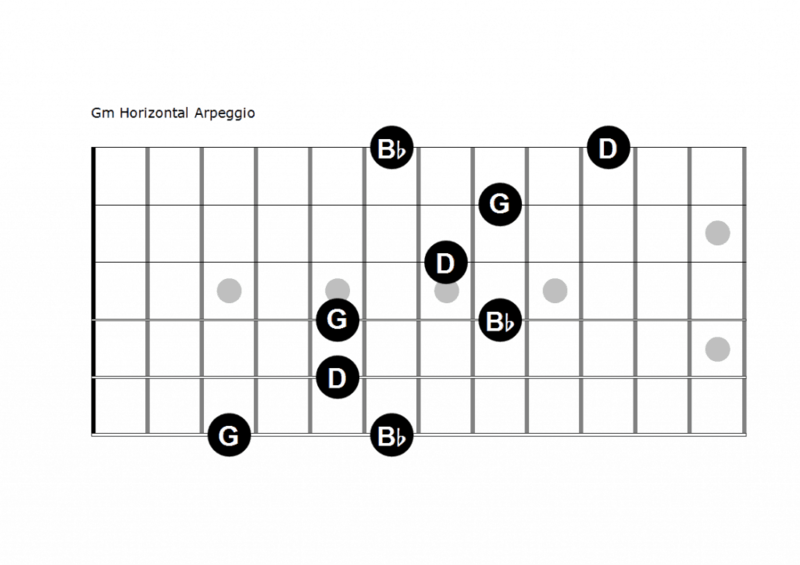 It’s now time for you to reflect on what arpeggios are, and the idea of connecting them using the horizontal positions. It can take a little longer to apply guitar arpeggios than to understand them, but when it all clicks, it will enhance your fretboard knowledge and boost your improvisation options massively. When you’re ready, try out some different chord progressions that you know and love, and jam along using the arpeggios that match. Take your time, enjoy this method and have fun creating your own solos and melodies.